Fans of the blog Local Lovely and podcast My Open Kitchen are in for a treat as author, journalist and photographer Sophie Hansen joins us for a special event in Melbourne to launch her new cookbook, A Basket by the Door (Murdoch Books). Her delightful book is a seasonal collection of 130 recipes to cook for family and friends who might be needing a bit of love, nourishment and cheering up. The recipes are full of love, generosity and care. Come along to meet Sophie and hear about life in Orange, writing books and blogs and growing communities. Plus sample some tastes from the Autumn chapter of her book, cooked by Jenna Abbruzzese of Our Kitchenette, over a glass of wine with friends. Sophie’s book will be available to purchase on the night. Join us as the women of Massi and Mister Bianco create this special dinner for the Fully Booked Women community. Guests will enjoy a five-course feast designed by sous chef Rachel Kellar and chef de partie Charlie Chou. Dishes will include Sher Wagyu tartare, as well as asparagus fritti with ricotta and prawn tortelloni in crustacean bisque. Jeni Kolkka of Curly Flat will match each course with her wines from the Macedon Ranges. 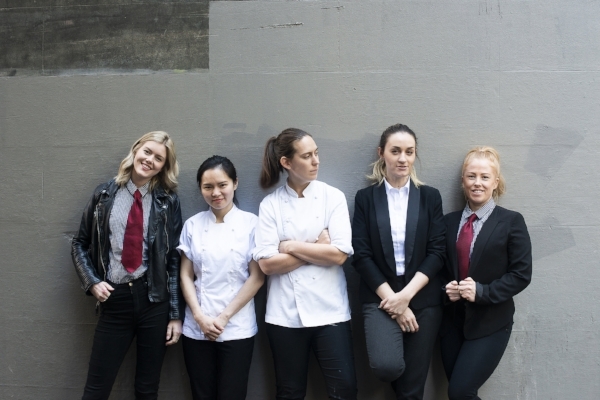 Restaurant manager Jade Ryan, assistant manager Nicolette Fehr and function coordinator Vanessa Aliano will head up the front of house team. Maria Canabal, who’s in Melbourne for GROW Assembly, will be our guest speaker. Maria is founder and president of Parabere Forum, an international organisation promoting women's voices through gastronomy. They host an annual conference, have developed an app featuring women-led restaurants around the world and work tirelessly to promote women through events and festivals. Back for its third year in Melbourne, GROW Assembly is a day-long series of talks to inspire those working in hospitality. This year the focus is on Community, and we’ve taken that as the theme for our dinner also. Here at Fully Booked Women, we are big on community and love when we can work with our peers to create something special. This event is a collaboration between Fully Booked Women, and the teams from GROW Assembly and sister restaurants Massi and Mister Bianco. Hosted by Virginia Selleck, sommelier and co-owner of boutique wine emporium Magnum + Queens join us for an engaging conversation with industry leaders about wine from the grape to the bottle to the glass. Virginia Walsh, Co-founder and financial controller of Cellarhand. Come and be part of the conversation and sample wines from some of our brilliant Victorian wineries including Reed Wines, Symphonia, Fleet Wines, #winecrafter Tamara Irish, Sutton Grange, Quealy, Bird on a Wire and Ros Ritchie Wines. Plus kefir from The Fermentary and snacks to nibble on. Hosted by teacher, writer and creator of Phenomenom Alice Zaslavsky join us for a highly entertaining conversation with industry leaders about food, community and the future. Flavour magician and ice cream whizz Karina Serex of Sundae School Ice Creamery and Tuck Shop Takeaway. Come ready to fill your mind with ideas and your bellies with food by Jenna Abbruzzese of Our Kitchenette. Drinks curated by Meira Harel.